Find out who is active on your network! 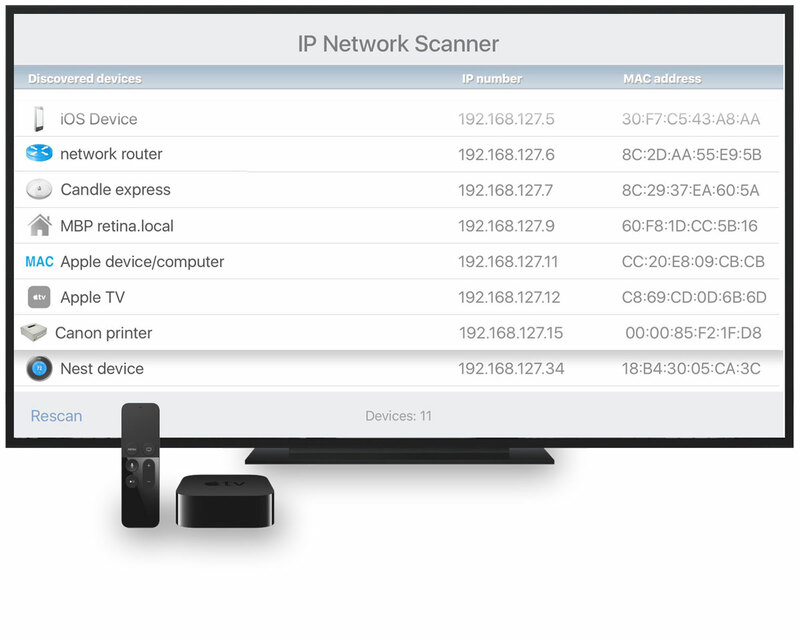 IP Scanner for Apple TV uses the same, powerful scanning engine as our highly acclaimed application for MAC, but in a lighter-weight package. • Customization: once IP Scanner has detected a device, it will attempt to identify it based on its network ‘fingerprint’. You may also assign your own custom names and badges to devices that you recognize, to aid in visually recognizing that same device in a future scan. • Currently Active: IP Scanner TV displays the elapsed time since device activity was last detected. • Web Server: IP Scanner TV tells you whether a given device is running a web server, to better identify cameras and other configurable devices. Don’t forget to check out the additional settings for IP Scanner TV in the Apps section of the Apple TV Settings app! N.B. : Currently, there is no way to link directly to the Apple TV app store, so the only way to actually purchase IP Scanner TV is to search for it in the App Store app on the Apple TV itself. We hope this awkward situation changes soon, and when it does we will be sure to post a helpful link here. IP Scanner TV for Apple TV is the quickest way to get an overview of connected devices on your home network.